For immediate action, complete the form. Your local Riviera Finance Business Manager will contact you. 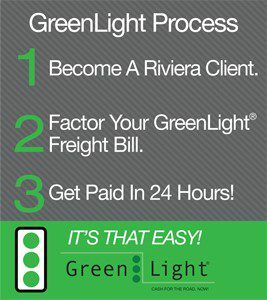 The Riviera GreenLight® means this load is approved for factoring. Become a Riviera Finance client and factor this freight bill for cash within 24 hours of verification. Riviera guarantees the credit on your load, and you pay a fee only when you factor a bill.